My Gosh I haven’t done an outfit post is such a while! It’s my first one since 2015… I dunno why I’ve been putting it off so long. 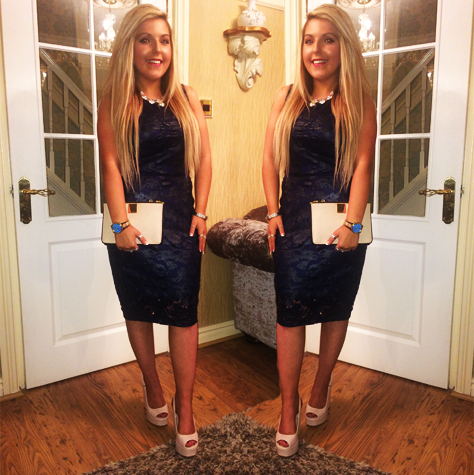 Saturday Night I had the perfect opportunity to get glammed up and prance about in my new two piece, shoes and clutch! So this is actually a Lipsy Two piece not a dress! You can fit them together like I have done or have a bit of stomach showing! I managed to get both of these in the Asos sale, worth £68 I only paid £16 for the skirt and £8 for the top! It’s a gorgeous material with applique detailing. Accessories I’m wearing is the Ted Baker cross body bag, Dorothy Perkins Necklace, Michael Kors watch and Bracelet and New Look Peep toe Shoes. I thought I would add a bit of colour by wearing light accessories than dark to match the outfit.I guess you could say im mixing a bit of winter and spring together! I actually love the Ted Baker bag, i think it’s definitely more of a clutch bag for me, with little compartments it fits plenty in! What do you think of my first OOTD of 2015? Cute look! I love that it’s two pieces and not just a dress!